This is another blog post about running totals and again I will use CLR and demonstrate the power of CLR in such situations. Again this post is inspired by an article on SQL Server Central – Calculate the Running Total for the last five Transactions by Divya Agrawal. This is a kind of running totals when we want to sum only a specific number of last rows. The CLR function will be nothing than a slightly modification of the running totals function from my previous blog post: SQL Sever and fastest running totals using CLR. I’ve updated this blog post based on the update of mentioned previous post, after communication with Paul White and added the security check into the CLR function to detect processing of rows out of expected order. Please read the previous post for more details. I will use sample data from the article, so it is possible to compare the solutions and we will be able to see the difference. As I mentioned above the CLR solution is only a modification of function from previous blog post. We only add a queue of last calculated running totals. The image above displays situation when we want to make running total for last 3 rows. 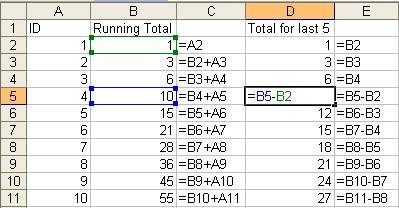 Our solution will calculate the running total continuously as it is done in column B, but when the requested count of 3 rows is met, it will subtract the running total 3 rows back as can be seen on the image in column B. For this we need in our function a queue of the last X running total values (In this example 3). This class also implements the security check introduced in my previously updated article related to Running Totals. The security check consist in providing the correct row numbers in the sequence in which the records should be processed and in case the records are processed out of expected order, an exception is fired. On first call the function allocates a queue of requested queue size inside a private storage class and stores it using the CallContext for use by future calls. The function also allows returning NULL when the count of rows processed is lower than the number of rows requested to be calculated in the running total and also allows calculation of classical running totals (not queued) in case the queue length is equal to 0. Once we have compiled the sources, created assembly and function in DB, we can make a tests. First we will test the T-SQL solution from the article mentioned at the beginning of this blog post and then the presented CLR solution. Table 'Accounts'. Scan count 37, logical reads 37, physical reads 0, read-ahead reads 0, lob logical reads 0, lob physical reads 0, lob read-ahead reads 0. We cab see, that for only a few records and the T-SQL solution produced 37 logical reads and the query plan is quite complex. And there is a lot of table scans. Then the plan will be better as we will replace the three table scans in the query plan by one clustered index scan and two clustered index seeks. But even now the plan is quite complex. Table 'Accounts'. Scan count 1, logical reads 1, physical reads 0, read-ahead reads 0, lob logical reads 0, lob physical reads 0, lob read-ahead reads 0. Here we can see, that the CLR solution produced exactly the same output as the T-SQL solution. What more, we have only 1 logical read as the table is small and we have also received a very simple execution plan with single Table Scan and Sort. The segment and Sequence Project(Compute Scalar) operators are the ROW_NUMBER() function for security check. The compute Scalar is our function computing the running totals. In case of the Clustered Primary Key the plan will contain one Clustered Index scan without sort as the Clustered Key is already in our expected order. As we can see from the simple test here, the CLR solution is unbeatable for such purposes. Even if we use other T-SQL solution like “quirky updates”, even then the CLR will have less reads and should be quicker. When increasing the number of records and increasing the last X number, then with higher number count, the T-SQL solution will kill even high end servers. On the other side you will see nearly no difference in speed when using the CLR solution. As it only needs to allocate one queue of last X elements. Even if we want to count last 1000 000 rows, then it only needs to allocate such queue and in case of bigint it will 8 MB + some overhead of the queue. Of course the CLR solution has the issues with processing rows in right order, but for that purposes there is the security check implemented so in case rows are processed in other than expected order an exception is thrown. But in most cases the scenario is very simple and you need to calculate the total from a simple table and in such cases this solution work without bigger problems. In case of complex queries with JOINS or other windowing functions, records can be processed into a temp table and then the running totals calculated on the temporary table.